flatex, the online broker based in Kulmbach, is one of the most inexpensive brokers in the domestic exchange market: For each order, €5 plus the corresponding exchange fees are due. In addition, foreign trade, OTC as well as CFD and FX trading are possible via several trading platforms, including MetaTrader4. The spreads for CFD/FX trading are just as competitive as the fees for ETF savings plans. As a subsidiary of a FinTech company, flatex explicitly, but in no way exclusively addresses active and professional traders. Especially from the perspective of investors engaged in limited trading activities, the following is considered a big plus in our flatex review: Account management is free of charge without any restrictions and conditions. But: Securities account statements are only free as long as they are retrieved via the electronic postbox. In case of postal delivery, a fee of €2.55 will be charged per document. Since the broker entered the market in 2006, the flat-rate transaction fees, which are independent of the transaction volume, are an integral part of the brand’s core philosophy. Domestic orders are charged at a flat rate of €5 per trade. In addition, exchange-site fees are charged, which are covered through trading-site-dependent charges by other brokers. 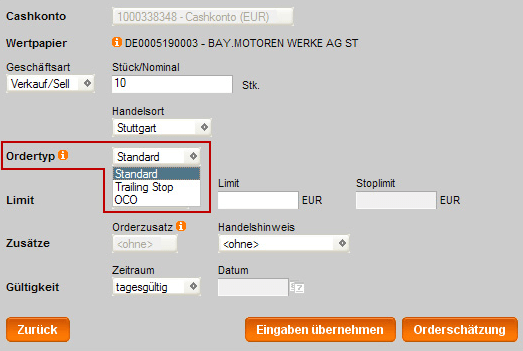 For an order via the electronic trading platform Xetra, the exchange fees for an average transaction volume amount to approx. €2. Limits are free. The domestic trade conditions are a significant pro in our flatex review. The order fees are lower than that of almost all competitors, regardless of the transaction volume. In the case of most of the direct competitors, the minimum fee, which is independent of the transaction volume, exceeds the flatex flat rate. In the case of large order volumes, the savings is easily €50 to €80 per order in comparison to the competition. One weakness of the broker's fee structure affects dividend credits: There will be a charge of at least €1.50 per credit, which proves to be disadvantageous for broad-based portfolios and owners of many US securities with quarterly interest credits. The order fees for the 11 available foreign trading venues are settled on a flat-rate basis and independently of the transaction volume, wherefore they are more favourable than those of the majority of the broker’s German competitors. Orders in the US and Canada are settled at €7.90 plus stock exchange fees; orders at most European stock exchanges incur a fee of €24.90 (fixed price). In 2016, flatex introduced ETF savings plans. The savings plan fees are a big plus in our broker review: €0.90 are due per transaction. In case of savings rate of €50 in particular, the costs are lower than those of most competitors. The fee is waived for comStage and iShares savings plan EFTs. In addition to securities trading, flatex offers derivative contracts (CFDs) and foreign currency pairs (Forex) trading. 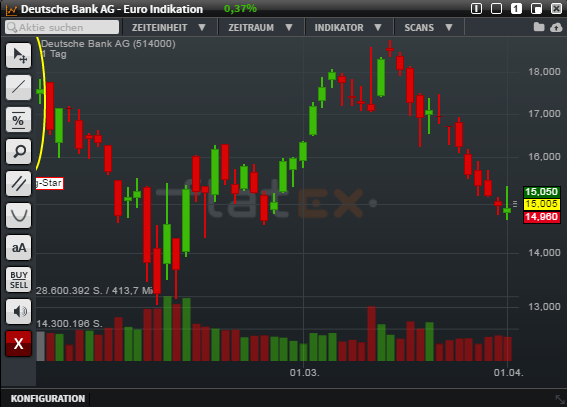 Trading is based on a market maker model and Commerzbank AG acts as market maker. As a result, CFD traders at flatex are relying on the same market maker as S Broker and comdirect. Trading in stock CFDs involves a commission of 0.05% of the transaction volume – at least €5. For the DAX future, the commission amounts to 0.01%; for other futures, it amounts to 0.02% or at least €5. Trading almost all other base values (indices, commodities, foreign exchange) is commission-free. In this case, market makers and intermediaries (flatex) generate their contribution margin exclusively via the spreads. The spreads for DAX CFDs start at 2.0 points, while the Dow Jones CFD is associated with a spread of 3.5 points. In EU/ USD, the spread is typically 1.0 pips fixed or 1.3 pips depending on the platform. flatex securities accounts can be used for trading on all domestic stock exchanges, on 11 foreign exchanges, and for off-market trading about 20 issuers. In addition, CFD trading is possible via an integrated solution without having to open an additional account. In foreign trading, the stock exchanges are linked to the USA, Canada, Austria, Switzerland, France, Italy, Belgium, Portugal, and the Netherlands. While the flat-rate and low-priced pricing model as a whole are a major plus in our flatex review, there remains a certain lack of transparency with regard to the exchange fees. Other brokers set a trading tariff, via which the exchange fees are paid. Others, however, charge both a trading centre fee and stock exchange fees. flatex itself states the following: “Given the last price adjustments of the stock exchanges and the associated complexity, a detailed list of the exchange fees is not possible at this point.” The broker merely provides an overview. Accordingly, the stock exchange fee for the Euwax and Börse Frankfurt trading venues amounts to €0.87; for orders via the electronic trading platform Xetra, it amounts to €2.00. Between €2.24 and €6.38 are thus due in stock exchange fees. Approximately 5,500 actively managed investment funds are available in the mutual funds business, of which about 3,000 are offered with a nominal discount of 50% on the regular issuing premium of the investment company. Around 100 exchange-traded index funds (ETFs) are accessible through savings plans. In this regard, the broker’s offer is considerably smaller than that of many competitors. 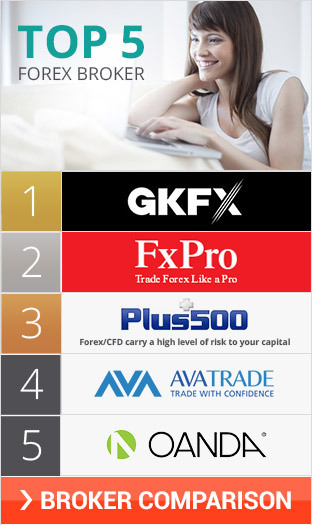 For FX/ CFD trading, the MetaTrader 4 trading platform and/ or the in-house platform is used. For exchange trading, investors can choose between a free basic platform and paid expansion modules. There are half a dozen order types available via the flatex platforms: Stop, limit, stop limit, if done, OCO, and trailing stop orders – for purchase and sales orders. For the majority of investors who are giving flatex a try, this selection should suffice since its is mainly professional traders that use even more specific order types. Nevertheless, there are brokers with a much larger selection. The order functions of the trading platform are thus neither a pro nor a con in our flatex review. Despite favourable ETF savings plans, a large number of customers, who are giving flatex a try, are either active or even semi-professional traders. In the securities business, the broker has opted for a free basic platform, which can be extended via additional modules that are subject to a charge. 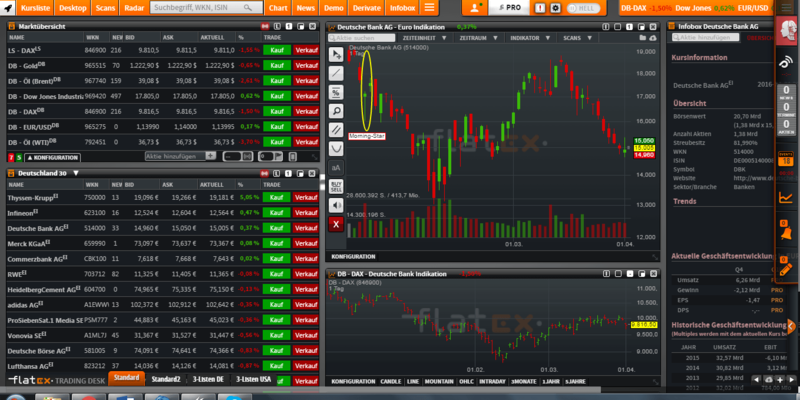 The screenshot above was taken from flatex Desk Trader (web-based version). The platform provides a relatively comprehensive charting tool. Various chart display options, technical indicators such as MACD, RSI, or stochastics, as well as drawing tools are complemented by tools that are not available as part of the software of most other brokers. This is the case, for example, for a scanner that can be used to search for candlestick formations (morning star, evening star, hammer, etc.). If these formations are found in the chart, they are highlighted. However, a powerful market scanner, which can be used to search dozens of markets for different technical criteria, is not part of the basic software package. 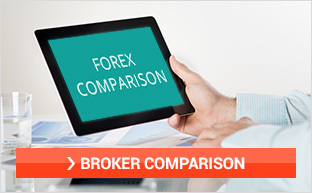 For off-exchange CFD/ FX trading, the MetaTrader 4 trading platform, which is also used by other brokers, is used. This platform has been equipped with a charting tool, various indicators, and other functions. For a fee of €29 per month, flatex customers can subscribe to the Trading Desk Pro Basic extension tool. Using this tool, technical strategies can be implemented, trading signals can be received via tickers and chart signals in real-time, extended lists can be used, and fundamental scans can be carried out. 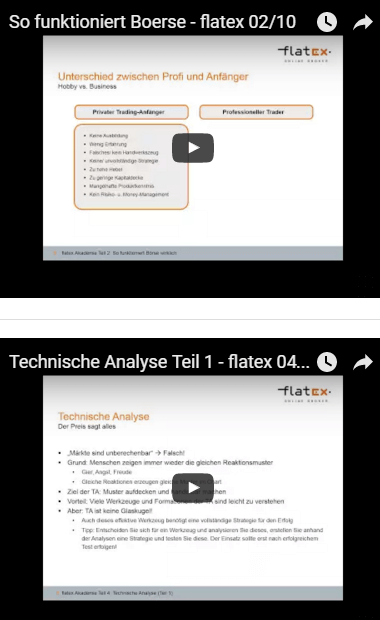 flatex GmbH does not manage its own accounts and deposits, but acts as a tied agent of biw Bank für Investments und Wertpapiere AG in accordance with §2 paragraph 10 of the German Banking Act. This means that deposits on clearing accounts are legally held in biw bank accounts. This bank is subject to the legal German Deposit Guarantee Scheme, wherefore customer deposits are hedged up to €100,000 per customer. Until January 2016, biw Bank was also affiliated with the Deposit Guarantee Fund of the Bundesverbund Deutscher Banken, which up to then had been liable for a sum of €3,700,000 per customer. However, biw Bank has since announced the end of its membership. In particular, CFD beginners, who want to try a broker like flatex for the first time, should pay attention to the rules regarding margin-call obligations: If losses occur beyond the existing account balances, they must be made up for by the customer. The broker does not explicitly forgo additional claims. Such claims can arise if deficit positions cannot be closed in time or only at a price very far from the entry price due to extreme market volatility or major price gaps. In this regard, MetaTrader 4 offers a significant advantage over other platforms: Given the large reach of the software, it provides a large number of ready-to-use trading systems, which can be imported into the software at any time. This means that tried and tested automated trading systems can be used without the need for special programming knowledge. A back test module is part of MT4: Mechanical trading systems can hypothetically be used in the past. The back test is used to determine the performance that the respective strategy would have achieved in actual use. The securities deposit can be opened without a minimum deposit and can, for example, be used exclusively for regular investments in ETF savings plans. A minimum deposit of €1,000 Euro is required for the opening of a CFD trading account. Deposits can be made by bank transfer. Individual and community accounts can be opened. Customers from Austria can also open an account or securities deposit via www.flatex.at. The account opening form on the screen should be filled out. The application documents are then sent by PDF. The legally required ID verification of new customers can be carried out either using the Postident or via the video iTAN method. In case of Postident, which has been in use for many years, a coupon and an official photo ID are presented to an employee at a Deutsche Post office. The still relatively new video identification procedure provides for ID verification within the framework of a video chat. An official government-issued ID is required as well. In addition to flatex, the company's portfolio includes biw AG (which acts as a white label bank not only for flatex, but for other companies, too), XCOM (software and technology), and ViTrade. FinTech Group describes itself as one of the market and innovation leaders for online brokerage. According to the company data, more than 5 million securities transactions were executed via the company's platform in the first half of 2015. FinTech Group companies serve 200,000 private individuals with total assets of around €5 billion. The acquisition of XCOM Group took place in March 2015. biw Bank possesses a full banking license and handles around €1 billion of customer deposits. Even the first customers, who gave flatex a try after the founding of the broker in 2006, were confronted with a new price model. At the beginning, the flat-rate prices were the main unique selling point of the company and heavily contributed to flatex’s excellent market position. To date, flatex is regarded as a particularly innovative company thanks to its affiliation with the FinTech Group. The broker conducts seminars on a regular basis and also provides clients and interested parties with video tutorials, which deal with the broker's products and platforms as well as general issues and questions concerning securities and trading. The seminar section includes live-trading events as well as themed webinars for the development of trading strategies, indicators, trends, and other topics. The video tutorials deal with fundamental issues such as the importance of the platform, one’s legal position as a shareholder, fundamentals of chart analysis, risk and money management, trading strategies, indicators, behavioural finance, trader types, etc. The broker's customer service team is available via phone and e-mail. There is a hotline for existing and prospective customers. As a rule, specialized brokers without their own direct banking business are expected to offer a higher or more specialized service quality than most broad-based direct banks. This expectation was met by flatex: The customer service agents were able to quickly and completely resolve a relatively complicated request. The broker, like most of its competitors, offers a customer referral program. If an existing customer (e.g. through a convincing flatex review) is able to get a third party to open a flatex account, the referrer receives five free trades, which are valid for one month. In addition, the referrer can receive a credit of €150, which requires 150 transactions by the new customer in the first three months after account opening. The conditions for domestic stock market trading almost surpass those of the entire competition: With its flat-rate price model, the Kulmbach company has put pressure to innovate on all German brokers, which still continues to be the case today. Additional advantages: Free securities account management and CFD/ FX trading via an integrated solution – albeit via a market-making model. The free trading platforms offer more useful features than the average competitor and the fee-based additional modules should meet the requirements of professional traders. The FinTech Group subsidiary, flatex, is a suitable address for all those who want to invest in securities and do not primarily trade abroad – and for those who wish to trade CFDs and Forex using a German broker.